I don’t think her body is very interesting but the potential draw that this offers is not bad given the fact that there are multiple house mormont characters worth running. Will she be worth the space currently? No, but maybe in the future she might. In what will be a relatively common theme for this pack, JC and Istaril are slightly higher on this card but Drakey and Ire are engaging in some traditional Finnish cynicism. The comparison to Rodrick isn’t kind, but it’s the comparison to The Blackfish that is particularly damning. How come Maege is “all-in” on the trait synergy, while the Blackfish has a trait-synergistic effect and a generally-good effect, and renown? Those cynics among us suggest it might be to do with one being a champ card. 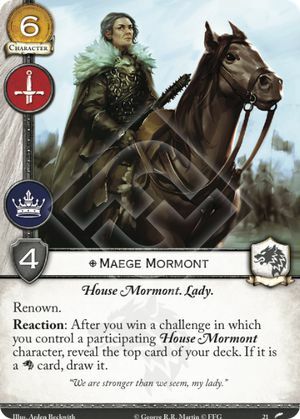 If we get multiple efficient cheap Mormont characters in the future she may find a spot, but until then the point of a centrepiece card is to stand tall and elevate the characters around them, not release as inefficient and hope they can be elevated by other cards. Stark is so draw-poor that even Lady Mormont’s pseudo-insight looks alright. Of course, she’s competing with Blackfish and Rodrick for deck space (two remarkably similar characters that make one question why the designers feel yet another 6/4 mil/pow draw character is a good idea). 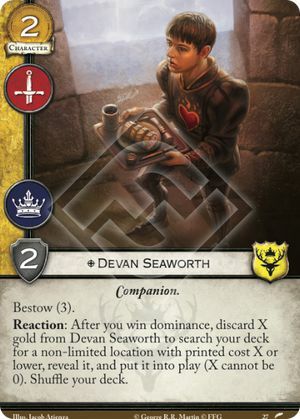 There is an obvious comparison to be had with Rodrick (and to a lesser extent the Blackfish here), as a 6 cost 4 strength bicon who lets you draw cards. Maege is kind of the safe option of the 3 as she allows card draw both in power challenges and on defense, making it very likely you gain at least 1 card per turn. However, she isn’t likely to grant more than 2 given you’d need a few other House Mormonts (and bannering for Jorah isn’t going to help!). Realistically, unless we see more House Mormont tech Dacey is our only other option for “insight” here. With all that in mind, she then looks like a Blackfish with an option to draw in power challenges at a cost of having the the potential to stand. That doesn’t seem that good. The potential to kill off chuds in dominance is very strong, with the upside of being able to kill larger characters is actually reasonable. I think this will have a home in tempo / pressure orientated stark decks. We were close to a 4, with the Finns actually being higher this time. It’s very expensive, having to pay an initial 2, plus the strength-cost of anything you kill, plus you have to pay it in advance meaning you’re taking a tempo loss on the whole thing. That said… it’s repeated targeted kill. Repeated targeted kill in a game still predominantly about using characters to do things seems good, no? HoBaW is non-loyal so I’d be looking at Lanni Wolf for Tyrion & Goldroad income to refill this killing machine each round. Could be brutal if you can make the economy work. Stark need a bit more murder, and this could fit the bill. Killing a chud for 1-3 gold so your Marched can hit a bigger guy on their side seems a solid enough use. Whilst you could bestow it for lots of gold, I think just putting 3 on it, and then refilling it each dominance phase could prove the better play. However, that runs into a problem - aggro kill decks that like 2 claim plots tend to lack the funds to play this out, use it, refill it, and play enough other cards to win challenges. In House Stark, this therefore seems more likely to act as a +1 claim card in its own right and go into a summer-heavy deck that has lots of gold to spare. Where the card shines is that it isn’t loyal. Martell and Lannister both look like they can use this well in a Wolf Banner, and a Tyrell Wolf Roose deck could become a thing again as it was during a phase last year. A weird econ card for a deck that doesn’t really exists, too expensive at the base cost with a poor body to ever see play outside of fringe situations I think. Good on that Kayce Merchant for selling enough spoons for armour, and for learning how to at least be efficient on the turn entering play. Still a boring vaguely economic bestow card though, innit. You’d be better off with almost any other Knight character instead of this guy. 3 gold? Yuck. Monocon? Yuck. Situational ability? Yuck. Uninspiring stats, but if you bestow for just 1 and play another knight out that round you effectively are getting a 2 for 3 monocon, which is sort of OK? 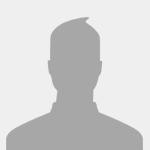 If this guy gets bestowed for 2 and lasts long enough then you sort of got a 1 for 3 monocon, which is better. 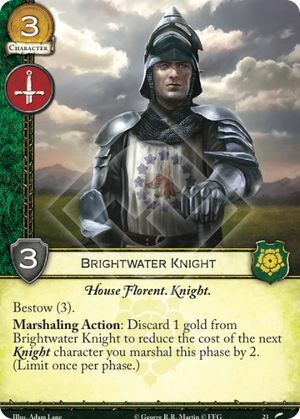 The problems are that firstly Tyrell really aren’t lacking for gold, and secondly I don’t see where the room is in knight decks for this guy - if Knight of the Reach can’t make it in I’m not sure this is any better. If Caswell’s Keep is a good enough location for House of the Red Door then this card actually becomes quite scary, outside of that combo, it might benefit a Conclave deck. Caswell’s Keep + Oldtown might be a bit too janky, however drawing 3 cards per turn and getting a free power each turn is actually quite strong. Istaril is looking at this card in an HRD 59 characters deck and looking forward to playing his alt-art Marching Orders. For the rest of us… well, to quote Ire, “It says draw and power and costs 2, seems to check the boxes”. 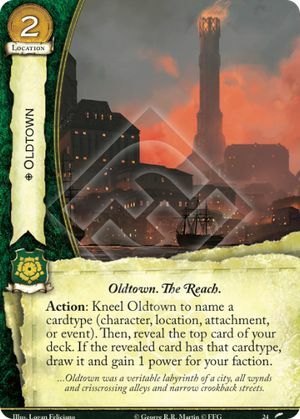 Oldtown goes into only a couple specific Tyrell builds (not the majority), but it’s a solid engine when paired with a little deck manipulation or for decks heavy on a single card type. As the name would imply, this works well in Conclave decks, where it pretty much will draw a card and gain a power per turn. Unlike a lot of other power gain locations it puts the power on the faction card, making Sea ***** a less significant threat. Tyrell also have options for deck filtering, to increase your odds of a hit rather than having it be just over 50% for naming character in most decks. I think this card is a tad too janky to be worth playing, the effect is interesting however the body of Dareon just isn’t good and at 3 cost is too expensive to run as just an enabler. In the future, if the Watch get a few more songs to add to their dusty old jukebox, he good gain value. Right now, however, you could drive a truck through the gap on a Venn diagram between the “NW choke” and “Minstrel Song Synergy! !” sections. Good idea…. poor execution. Choke decks want this ability but aren’t realistically able to spend 3 gold for it. Choke is also poorly placed in the current meta as more viable economy options continue to roll out, like Iron Bank and Redwyne Straits. You aren’t taking him for his stats, Night’s Watch have plenty of better alternatives. That means you are looking for a Steward, and maybe a use of his ability. The Rat Cook is a natural fit for this, and makes me wonder if we are going to get more Steward tech over the rest of the cycle - if this does happen obviously his value increases. If not, then someone surely will make a Tyrell Watch song deck? This rating might be too high but I like this card in the sense that it doens’t cost any gold nor faction card kneel. This card works well with enters play effects, currently I don’t see a lot of good use for this in a NW deck, maybe this can work in a banner package for a Martell or Tyrell deck. We’re not sure if Sam’s excited-yet-nervous about the prospect of Gilly asking him to prom, or if he’s thinking “crap, I left the fire on with that valuable tome right next to it!” Either way, the card itself… honestly for current-usage probably should have a 1 (once NW gets more enters/leaves play effects that would potentially change), but it’s so novel we can’t help ourselves, upping our rating like a moth to a flame. The only trick I’ve been able to think of (besides the obvious dodging of plot resets) is to trigger Mace/Hightower during the plot phase. But then you have to run Banner Watch instead of Summer or Rains, and that’s difficult to envision. The most obvious application of this is to allow you to play out an extra character, and then still be safe in the knowledge that they can dodge the reset your opponent might play out next turn. Maybe playing that extra character baited your opponent into doing the same and they will be hit harder? Aside from that, characters with good enters/leaves play abilities are always good for this - sadly Night’s Watch don’t have that many as Benjen has to be “killed” and Yoren must be marshalled. Being able to refill a bestow character could also work, though you’d need the gold stored somehow from the previous round, using a trick like Ranger’s Cache. 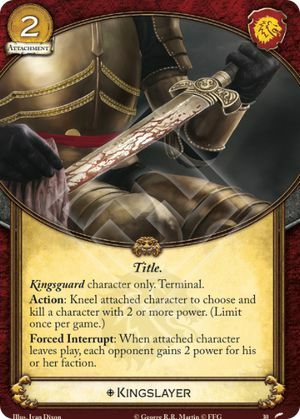 As a Banner card this could have a lot more applications, allowing you to remove terminal attachments from a key character, or trigger Orphan of the Greenblood or House Florent Knight for example. Maybe the latter option has decent potential, opening up a board for Marched? This card makes me so excited, tutor effects are always strong and when they are put on a chud with an efficient body, the value goes up tremendously. I think this card is very strong in a Bara House of the Red Door deck, running 3 Devan’s, really allowing you to build up your location base and go from there. This card has great synergy with Traitor to the Crown from last pack and should give Bara some more consideration with a portion of the player base. Ire and Istaril higher on this, but cynicism wins out. JC and Drakey are annoyed by it being tied to dominance (encouraging the fetching of more dominance cards…) and having a whiff of win-more as a result. That said, it’s a relatively cheap tutor, and it has the potential to do interesting stuff, even if it probably won’t actually do it in practice. Still more dominance tech for Baratheon (will it ever end?). The most likely scenario is Bestow 1 to grab Flea Bottom, Spears of the Merling Kings, Iron Mines, Plaza of Pride, or something similarly efficient. You could even Bestow 2 and discard 1 gold during 2 different turns. A Flea Bottom search on a stick is tough to argue with, and a 2 for 2 bicon isn’t bad even if you don’t use bestow. Unless you are facing a dominance deck, which is less likely currently with Bara not being the power they once were, you have decent odds to trigger the ability, and there are plenty of locations I’d happily look for, even if I just wanted a dupe at times. 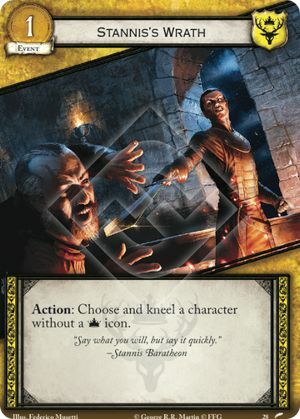 Despite the fact that kneel is Baratheon’s thing, I think this card is actually a Martell card in disguise, they have the icon stripping power to make this card a lot more threatening. That having said, kneel has fallen of to some degree as more stand enters the metagame. In tempo orientated decks I think this card will do wonders. My dream is to build a deck of 60 Baratheon kneel events. We’re ¼ of the way there already! Stannis’s Wrath looks good on paper, but Mil/Pow and Int/Pow are common icon pairs for most big guys, with Mil/Int less common (*I haven’t fact checked that but it feels right), so it’ll take icon removal for Stannis’s Wrath to really shine, and then you’ve expended two control effects on a single character, which is less than ideal usually. Baratheon kneel is starting to increase in variety now, with this event actually hurting Night’s Watch unlike their previous negative tech. Most factions do not lack for targets, even if it won’t necessarily be the character you want to affect most, though in Baratheon fealty I’d prefer both Consolidation of Power and Saving the Kingdom. This looks to be best used in Martell Stag, where use of Condemned or Nymeria can ensure anyone is a viable target. 1 cost for a kneel is never going to be bad though. A random clansman that has some ability to jump in, however either something needs to die on your side to be able to do your military challenge with him or they have just claimed for mil making this card a lot less interesting seeing how it is a monocon. 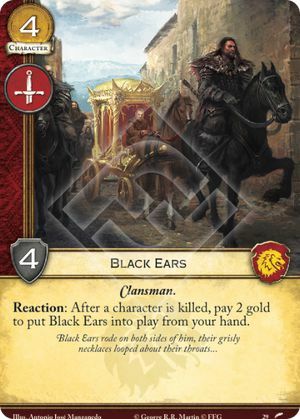 Lannister and especially clansmen have ways around that but that does hurt the value of Black Ears for me. JC a lot higher on this for the efficiency, but overall the verdict is “too vanilla to be worth it”. Bouncing into play and being able to be returned and come back is good for Clansman of course, but ultimately they’re just a 4 STR monocon. Yay? Meh. I haven’t played Clansmen enough to call myself an expert, but I don’t think this even makes the cut in its own tribal deck. A military mono-con that’s blank once in play isn’t helpful, even if it’s situationally a “bargain” at 2 for 4. Let’s face it, characters die in this game, whether yours or your opponents. Black Ears lets you gain a slight bonus from this, being decent enough as a 2 for 4 monocon. An easy include in Clansmen and maybe a cheeky one of elsewhere. 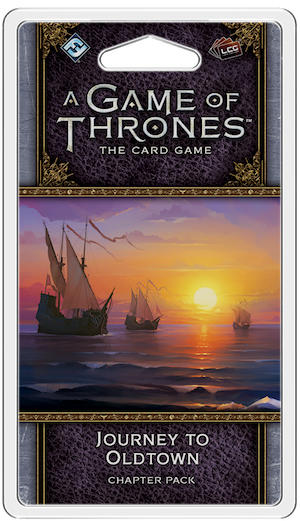 And once more FFG manages to print cards that are clearly meant to be included in your sideboard… oh wait, Thrones does not have a sideboard. This card can be saved against while at the same time your opponent would always get the power from this card making it even more unplayable. A very flavorful card that is not meant to be used in an actual game I think. This is interesting enough, but it’s also very, very bad. So, so restrictive in who it can go on, who it can target, what you have to do to target it… and it doesn’t give a strong power advantage since it gives the power back (or, if you don’t get to trigger it, just gives them extra power as a nice bonus!). Move along and don’t look back. Far too expensive and situational to even make the preliminary 75+ card draft of any competitive deck. But I’ll give FFG points for flavor. Wow, the first edition prized keyword is back! This is undoubtedly a very powerful card, and a great answer to renown based decks. The fact the kill can be saved means that Mace-centric decks aren’t sweating too much though, and the price and drawback feel a bit heavy. IF it weren’t Kingsguard only I’d put a cheeky 1 of in Lanni decks, but as is it’s too risky. Where I think this one will get interesting is in melee, particularly if you remove your character wielding this at a point where 2 or more opponents are on 13-14 power. Looks like the Kingslayer could be a Kingmaker! Like scantrell24 I am giving a higher score because I like the idea. 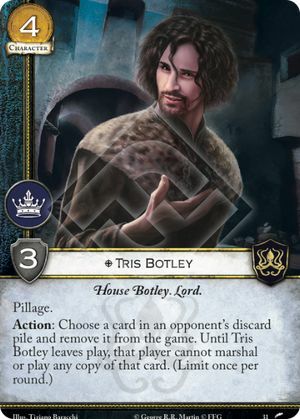 I never expected Greyjoy to get more power monocons... That said, I do think that this one is worth running, not only does Tris come from the single most popular house in the game, House Botley, he also has the single most important key word in the game, Pillage. On top of that he allows you to truly mess up your opponents plans while he is in the game, that is if you can pillage some sweet cards or you know, just have your opponent dump them in their discard for you to ban out. JC is off in the distance raving about combo and laughing, but the adults at the table are less enthralled by yet another power monocon for Greyjoy, and this one in one of the higher cost points. This has a whiff of first edition Baelor Blacktyde, and he was a fantastic card, a centrepiece for choke decks. 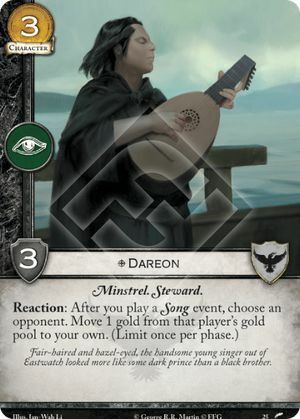 Baelor, however, was a 3/3/bicon with Stealth, not a 4/3/monocon with Pillage. Worlds apart. A new and interesting ability paired with one of the worst bodies imaginable. Put those together and you’ve got a balanced card that can be good, but it’ll take some work. I didn’t know that Dan Kaye had a champ card? This does a lot to stop combo decks, or at least force them to change strategies by holding on to key cards and not just discarding them early. Triss also seems strong in a choke deck where he can prevent opponents from playing their limited economy locations such as Kingsroads. Or maybe you just Confiscated some Milk and you don’t want more of it playing out? Even as a power monocon Triss feels like an auto-include in a pillage deck and a strong candidate for a 1x elsewhere. Another random warship for your Greyjoy collection. The reaction is quite powerful but is a bit niche I think. If you want to go all out on your pillage, then this card might be your thing. If you have Asha on the board, this becomes a tad better. I don’t expect this to see a lot of play outside of pillage orientated decks. Ire is very excited here - to quote him, “Draw boat Draw boat Draw boat Draw boat [this could’ve gone on longer but we’ve cut it off]” - the rest of us are looking at in comparison to Lannisport and thinking that, yeah, this seems fine enough but not astounding. That Warship trait (good for PIllage because of the Raiding the Bay of Ice synergy) and the Asha Greyjoy kicker do help push this up though. Asha with renown is scary (mostly Core Set Asha who can attack multiple times per phase, but also the upcoming Asha and any versions thereafter). 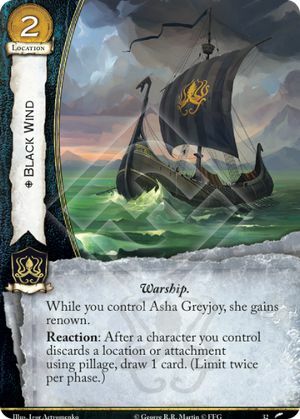 But even more importantly, Greyjoy finally has another draw engine besides Great Kraken, and this one should pretty reliably average a card per turn in a dedicated Pillage deck. 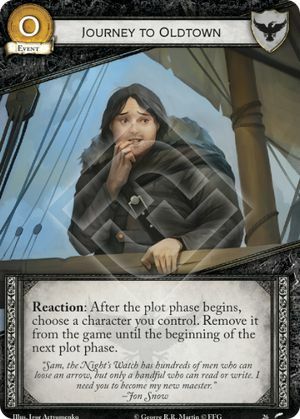 I thought the upcoming discard agenda would be the obvious choice for Greyjoy pillage, but House with the Red Door into this seems so much better. Even without Asha in play a chance for drawing 2 cards is really useful, and with Asha this is all the better! Any renown character participating in multiple challenges will provide so much more rush potential. Needs building around to get the best of, but it’s undoubtedly a strong card. 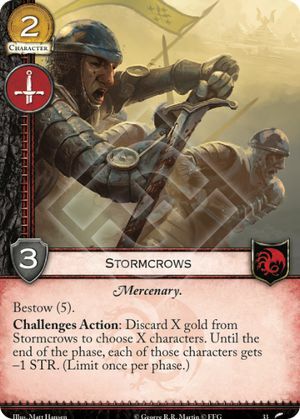 This card has multiple uses for different decks, it another mercenary for Daario to stand as well as more ways of getting negative strength buffs on your opponent's characters for burn decks. I love that this card only costs 2 and despite being a monocon, at least have a good strength to cost ratio. A good addition to the card pool. The Finns more sour here, because of the expense of the whole thing. JC and Istaril like the tricksiness of the trigger, being something both players have to play around in every challenge, although they accept probably its main use is on a Blood of the Dragon turn. Burn effects are better when there are more of them (redundancy = less variance = win). Targ decks will be hard pressed to make space for a military mono-con who’s blank on setup, but any deck that’s heavy on the burn will want a couple copies. If you ignore the textbox and traits, they are a 2 for 3 monocon, making them as good as Braided Warriors, which still make it into Targaryen decks. Adding in the bestow effect just makes them silly, as a singler gold on them now increases the threat range of Dracarys! to 5 strength. A solid setup card with a nice optional ability, and potential to be abused with Flea Bottom. Not only does this card have, in my opinion one of the best arts in the game, it also is the first terminal burn event that doesn’t require any dragons to trigger. That is important for a few reasons. True burn decks will now have 6 different events that apply terminal burn effects while Targ decks that don’t run dragons also get excess to a burn card that can help them push their advantage. The self-imposed discard theme for Targ can potentially become a problem as their draw is not the best, therefore you need to carefully determine what discard effects you want to play. 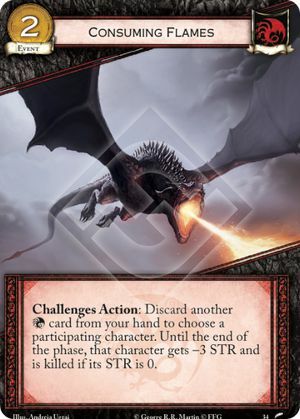 I really like this card in combination with the unsullied making this card burn a lot more characters to the ground and if they don’t oppose the challenge then that is also fine. Istaril higher, Drakey lower. It’s a huge deal for Targ to get a burn card that doesn’t require Dragons; but it is also 2 gold and 2 cards, not exactly a cheap deal. It’s very good, and a card people will have no choice but to fear for a while, but that slightly costly wonkiness stops it from truly Consuming us all. Meanwhile, Ire and JC are arguing over which song to go with. or ? You decide, vote in the comments below! Flame-Kissed returns (sorta) and man is that artwork an improvement over the original. Targ event slots are really tight but it’s easy to imagine a deck (maybe HwtRD Plaza of Punishment? Or just good old Fealty) with 2-3 Consuming Flames, 3 Dracarys, and 2 Dragon Is No Slave. Shouting “Consuming Flames!” doesn’t have quite the same ring as “Dracarys!” though. There are plenty of times where I have used Dracarys! on characters with 3 strength or less. Some are very good in their own right, such as Threeon. Military chud blockers as targets let me gain unopposed power and effectively increase my claim. Under those circumstances, this is basically giving me 3 more copies of Dracarys! in my deck, without even requiring a kneel. However, we then come to the cost. Discarding a card can be read as an advantage when you have Flea Bottom, but adding in a discard for Plaza and maybe a couple for Qotho, you will get to a point where you simply can’t draw enough to get anything going. It also makes this card weaker in banner decks. I think even with this factor it gets full marks, but that has the potential to go down if any more similar effects are released. A large insight character with the correct icons as Martell loves, that part I like. 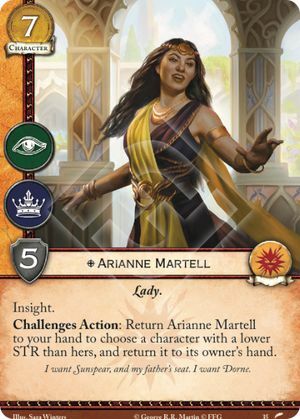 However not being able to run core Arienne is such a hit to most Martell decks that I have trouble seeing a home for this card as so many of their tricks are enabled by core Arianne. Probably someone will find a good use for this card and make all our lives miserable though, I have good faith in that. Istaril and JC are higher here, with JC proclaiming her “one of the two best Martell characters in the game”. (The other, of course, being Core Arianne sadly.) The action advantage of being able to uproot your opponent’s boardstate at the time of your choosing, combined with her having Insight while she’s still in play, makes for a highly potent card. The Finns are in their cynical role though, not thrilled about the STR limit, meaning you’re relying on combos to actually remove the characters you most want to (just what Martell needs, more combos!) and just generally a touch unexcited. New Arianne is a great tempo character, but so is old Arianne. Martell will enjoy the Insight, but they weren’t really struggling for cards before. Like the first edition Ghaston Grey, this card can seriously mess with challenge maths, with a common scenario being to win a challenge with Arianne, then return her to hand to enable an unopposed challenge or to simply make your opponents challenge fizzle. With Core Doran around Arianne has the potential to remove some very hefty characters, meaning you will often be trading similar amounts of gold by using her ability, the difference being you often get to use her in challenges first. By returning characters to hand you also remove attachments and power, and can dodge resets and re-use enters play abilities if Arianne is used on one of your characters. This card has a lot of potential, as long as you have the economy to back it up. This card allows your Water Gardens to ramp up in usefulness in a hurry, however I do not know if you have the deck space to run this card. This card does enable many things in Martell and as with Arianne, this card probably has a home in a deck that someone will probably build. Roles reversed here with JC and Istaril being the ones going lower. We all like the card - this comes down to how strong you think the NPE mass reset decks are, as the main use it currently has (which may change in the future) is probably going to be moving your non-reset plots into the used pile to cycle back around to your Valars sooner. Further application will emerge later, with The Wars to Come and Sand Steed spoiled. A fun card that allows players to go all-in on the big used pile strategy. It gives Martell a way to manipulate strength mid-challenge (when paired with Doran, Dawn, etc) and lets you run a situational plot like Marched without fear of it backfiring. Not a choice for “normal” decks, but pretty good in the ones where it belongs. This is a relatively easy card to enable as you can lose on attack if necessary. It is one of those cards where the uses are niche, but there are so many of them that chances are it will be effective. Aside from accelerating effects such as core Doran and Dawn, it also lets you cycle around to key (already used) plots faster, and pretend that plots you know will be useless in a given matchup, such as Duel, don’t exist. A cheeky 1 of? Yes please. Neutral renown with the potential to save characters is always interesting. The five cost slot is a good spot right now and I think that this card can find a home in many decks as a one off. In Brotherhood decks this obviously becomes even stronger. Neutral renown/saves? Good. Costs 5 and needs to kneel for the effect and have a power to discard and can’t save himself and can only save non-loyal characters? Less good. Nice for Bara Brotherhood, at least? He’s great for saving from Valar M, targeted kill, or claim, but that’s about it. 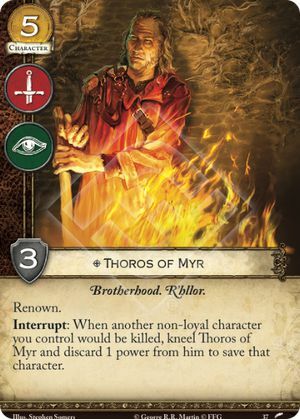 Maybe a Brotherhood deck will take him to protect their important characters (ex: Frey Lordling and Walder Frey in my version). The poor cost to strength ratio really hampers his case though. Could be hard to win challenges and earn renown to pay for the cost with only 3 strength. Non scary, charitable Victarion has good traits (particularly for Baratheon), renown, and a very useful ability. Whilst renown and a cost of kneeling to use his ability don’t work that well, chances are if you just play the game as normal with him out you will get good use out of his ability. The main drawback is the poor strength for the cost, which matters less if you do use the ability. You only want to play this going second really, because if you go first your opponent immediately gets the boost, messing up your tempo. Otherwise it’s good though, as you can build for the +2 while your opponent cannot build for the +1, and they’re also unlikely to want to target it for hate. Istaril says it’s “better than it looks”, but also rated it the lowest of the four of us, go figure. Great for decks with high curves (or lots of bestow like my Lanni Stag with Fever Dreams). Also great in decks that attack the opponent’s hand so he can’t spend the extra gold anyways. If Trading with Pentoshi is good, then Gates of the Moon might be too. A limited 1 for 2 is obviously strong, but giving your opponent gold is almost always going to help them as they will factor it in when playing out cards. 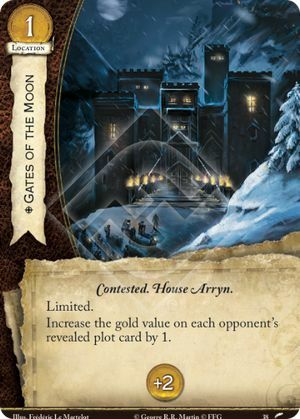 Night’s Watch get a bit more out of it as it makes it more likely your opponent will have 5 or more gold on their plot, and there is always the argument that you could include it because you will more effectively use the gold than anyone else. I’m not convinced myself. This card does so much for the game, it's not the strongest agenda out there but it does allow you to play a whole different play style. The consistency that this card gives you allows for decks to be much more streamlined and focused around a single location. Not only does this technically give you 2 more slots in your draw deck, it also allows you to hedge your bets and start out with different locations versus different decks. I am so excited to play with this card. The 4 gold on setup seems harsh but I think if you build you plot deck correctly that shouldn’t be a problem. Also I am happy that HrD The Wall is not possible.. The only unanimous 5 of the pack for us. Drakey and Ire are less-than-happy that that honour only goes to a champion agenda (that’s a first edition reprint to boot, ticking both the boxes! ), but JC and Istaril are just happy to see this wonderful card return. Istaril, being Istaril, is a fan of the neater templating compared to the sometimes-immunity of the first edition version; JC wishes it had stayed the same, but is still planning on pretty much only using this agenda for most of the rest of the year. 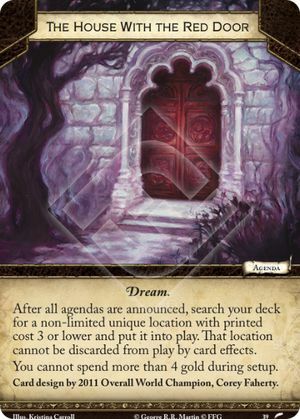 House of Dreams was one of my favorite first edition agendas, bested only by Dark Wings and Black Sails, because it enabled a lot of builds we would never have seen otherwise. Right now, House with the Red Door is only as strong as its best locations, and those are mostly boring draw engines like Great Kraken, Lannisport, or Red Keep. Hopefully in the future we see more jank like Bitterbridge Encampment. I’m also afraid the opportunity cost of HwtRD over another agenda like Rains or Crossing that does something during the course of the game is pretty high, maybe higher than in first edition. Even in its weaker state this agenda has a lot of potential to open up a lot of decks. 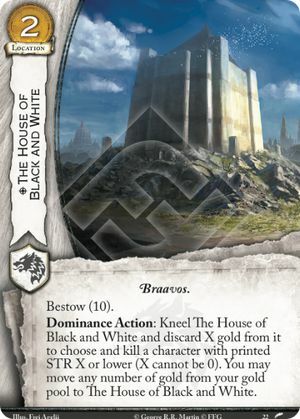 For many factions, making use of draw locations such as the Red Keep will prove popular, and the super-fealty variant of Stark Bear Island could also be an option. For the Shagga player this also provides a plethora of builds, with Bitterbridge (sadly no Old Nan) or Renly’s Pavilion powered House Florent Knights as 2 possibilities I can think of. Better deck builders than me (most of you!) will be able to think of more I’m sure. Generally the drawback on setup isn’t too bad either, if you can get a chud and a limited economy location you are looking OK. The one thing that makes me hesitate to give the 5 out of 5 is that 2 of the 8 factions have in-built answers to this agenda that regularly see play - Frozen Solid and Sea *****, with Dagmer a possibility to contend with as well. Options of course exist to counter these, but need to be found, and I feel that most other competitive agendas are not so easily shut down. It is still great to see this card back though for sure. 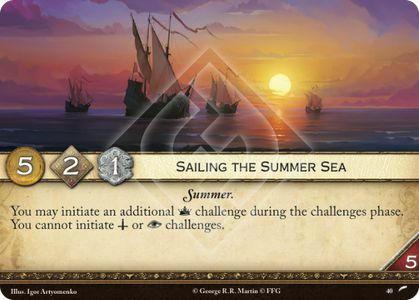 I actually think this plot might be very scary in the correct deck, I don’t want to imagine a Tyrell summer deck to potentially do up to 4 different power challenges in a single turn, the gold is reasonable but the initiative is not that great which hurts the closing potential of this card. 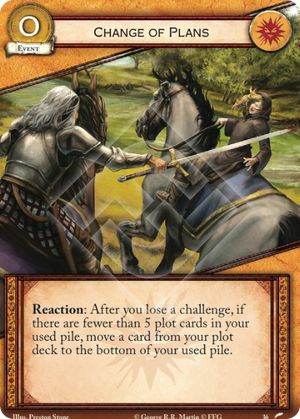 We like it less than Clash of Kings as a closer for a power-claim rush deck, simply because of the initiative; as a complementary card though, it’s solid. Never forget that the power challenge is the most important one, no matter what a Lannister player will tell you. Initiative is too low for a “closer” plot, so it’s hard for me to picture where Sailing fits. We also don’t yet have a non-kneeling Power attacker. There are plenty of decks that will happily defend a power challenge and win a power challenge on attack, claiming all the necessary renown, merely chump blocking the remaining challenges. This plot is for those factions, and they might even consider using it twice. 5 gold isn’t bad either. Just hope your opponent doesn’t reveal Calm Over Westeros! The drawback is that if your opponent knows you aren’t initiating military or intrigue they will be able to predict your attacks much more easily. You also have to have enough power icons on the board to take advantage of the ability, whilst still defending yourself. If you're hungry more content, check out the library of podcasts, articles, game video and more in the Community FAQ. Let us know in the comments how you feel about the cards in this box, and we’ll see you again soon to discuss the Kingsmoot chapter pack. Sand Steed? Seems I missed that spoiler. I find the House's reincarnation to be pretty underwhelming compared to the original. A 4-gold setup in 2.0 is much more restrictive than a 3-gold setup was in 1.0. The extra card in the starting hand doesn't mitigate things. Interesting that it allows neutral locations to be protected by its effect though. Other than that, I'd certainly go with A.B. Psychedelia for life! And for a slower psychedelic mood, after all opposing characters are burnt to cinders, nothing beats Roky Erickson and Burn the Flames, of course. "Meanwhile, Ire and JC are arguing over which song to go with. " Was on the Spanish agot spoilers instagram feed. An attachment that gives a power whenever a summer plot makes its way into your used pile.